It won’t be long until the summer comes. I’m quitting my job to follow U2 around on tour all summer. That’s what I declared a few months ago, anyway. I still like to say it for the dramatic effect, even if the circumstances have changed slightly. I’d decided I was ready to leave my job of four and a half years — didn’t know exactly what I wanted to do next, but knew I was ready to try a different company or a different profession or a different city or a different country. U2 had extended their 360° tour back to the United States, and I also knew I wanted to see more than my usual single show. So, setting forth with more vision than visibility, I started shaping my summer plans around about eight of their concerts, which would require way more than my vacation allotment. A lot of people (my mother) thought I was insane. I heard the word “excessive” more than once. “You’re going to quit your job? … to see the same band? … do the same show? … how many times?” Others were excited for me and encouraged it: “You need to go do that kind of stuff while you’re young and single and can spend the money on it!” (I held my tongue that old, married and poor … I would still do it.) I wanted to seem adventurous and embrace the wanderlust, but was secretly terrified of not knowing what would come after the tour, and being voluntarily unemployed for an unknown amount of time. But I knew I had to have my U2011 summer. If I got to August and hadn’t done it to the extent I wanted, I’d regret it. I had Zooropa in rotation in my car for an entire angst-filled month as I considered the implications of leaving gainful (though, during some of my company’s darker times, painful) employment for something most consider impractical and frivolous (my strong suits). How would I explain this gap to my future employer, who would undoubtedly pronounce it “Boh-no” rather than “Bahn-oh”? What if I never had another employer? How could I pay for my own health insurance and afford airfare, concert tickets and t-shirts? What would I do with the remaining 491 business cards in my desk? But, the lyrics of the album’s opening track weighed heavy on me during my drives to and from work: “She’s gonna dream up the world she wants to live in, she’s gonna dream out loud.” Following a rock band around the United States isn’t the noblest of dreams, nor is it one many other people can relate to or respect. But I decided it was mine. So, I am indeed quitting my job (in two weeks!). And I am following U2 around on tour all summer. 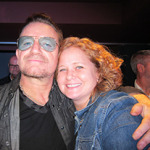 But now, I am (my mother is) very grateful that nine days after I see U2 wrap up their 360° tour in Moncton, Canada, my contract starts as an assistant professor of graphic design at the University of North Florida in Jacksonville. 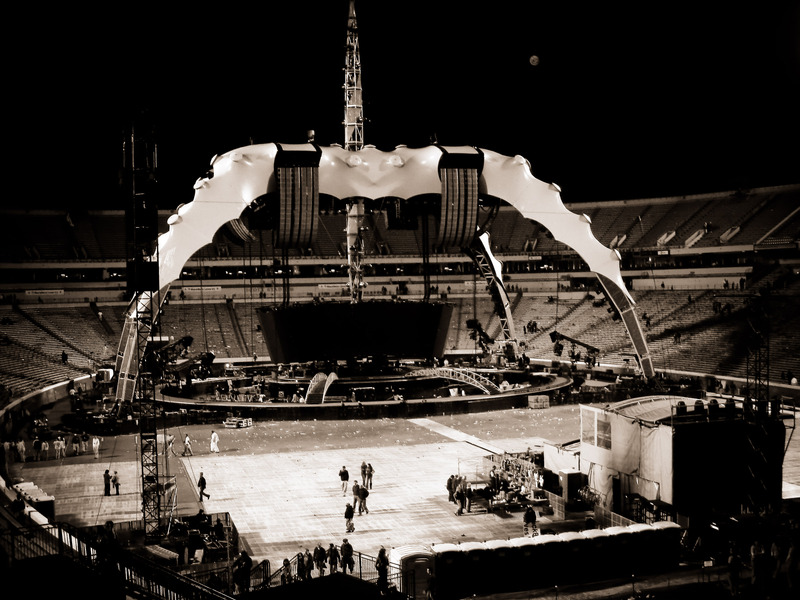 A view of the Claw after the U2360 show in Charlottesville October 1, 2009.